These unique and sought after office spaces in Almere are located in the Top Tower; a prize winning architectural building situated in the heart of Almere, in walking distance from local shops and restaurants. The building can be easily accessed by train and car, with only a short journey to Amsterdam’s Schiphol International Airport. Almere is the fastest growing city in the Netherlands and is perfectly located for business. At this superb centre, you can take advantage of a range of quality services, all with a comfortable yet impressive working atmosphere. The space is versatile with office suites, co-working spaces and meeting rooms. The space is well designed, and is accessible 24/7 so you can work through the hours best for your business. Within the immediate area, there are also banks, museums and local hot spots to explore and enjoy. 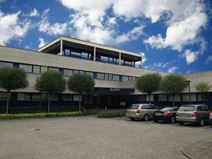 Just off Almere's city centre and within walking distance of the motorway junction, this business centre offers offices and meeting rooms. These office spaces benefit from parking facilities and a qualified support staff to help you run a successful business. There is 24-hour access and security for maximum flexibility, so you can work with peace of mind at any hour, and events venues at close quarters to this centre where you can host conferences and conventions. Offering fully equipped and beautifully furnished offices, this convenient location is ideal for those looking for a comfortable and modern space. Offices can be customised to your own style and taste, to reflect you and your business. Meeting rooms are available to book out on an hourly basis and you can use a range of break out areas including conferencing rooms and boardrooms for formal meetings.